"The Divide, presented in two parts, is a tale that unflinchingly explores a dystopian society of repression, insurrection and forbidden love. The Divide is set in the aftermath of a deadly contagion which, a century from now, has decimated the English population and rendered contact between men and women fatal. Under the dictates of an elusive Preacher, an unthinkable solution is enforced. Separated by the Divide, the adult survivors are segregated by gender, as men wear white as a mark of their purity, and women - still infected - are clothed in black as a sign of their sin. Brother and sister Elihu and Soween grow up learning the ways of their tightly controlled society. As they begin to glimpse the cracks in the system, Elihu falls for Giella, the daughter of two radical mothers, risking fatal disease and threatening to ignite a bloody revolution. 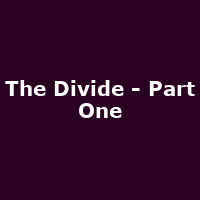 The Divide is a vision of a dystopian future defined by brutal repression and forbidden love." For 2018, the show is directed by Annabel Bolton, an Associate Director of The Old Vic, featuring Jake Davies, Erin Doherty and Weruche Opia.